Description of decorations: White pool filter sand covered with leaves and trunks of colors and textures similar to the represented habitat. Description of equipment: Canister Eheim and 72w LED with 8.000K. Water parameters: Temperature 28ºC, pH 6,2, KH 1, GH 0. Description of the area surrounding the biotope: Biotope located at coordinates S00º53’33 “W62º40’58.6” in the city of Barcelos, Amazonas, Brazil. One of the 6 beautiful igarapés of the left side of the middle black river, region of flooded forest, with presence of much organic material by the presence of the trunks, branches and leaves in the bottom of the river. 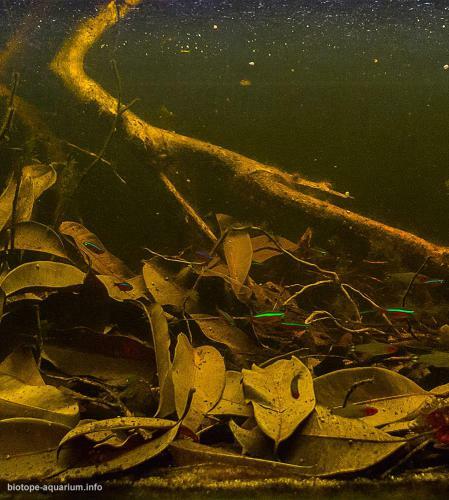 Description of the underwater landscape of the biotope: The landscape is composed of fallen branches, trunks, roots and many fallen leaves that cover the entire bottom of the stream. Description of the parameters of the habitat: Yellowish water, approximate temperature between 26 / 28ºC, dissolved oxygen of 2 mg / l and acid pH 5.4 accentuated by the presence of organic material. List of fishes and invertebrates occurring in the nature biotope: The most abundant fish found in the region are: Characidae, Hemigrammus vorderwinkleri, Hemigrammus analis, Paracheirodon axelrodi (single ornamental fish). List of plants found in the nature biotope: No plants were found for this specific igarapé.